Problem:- Java program to find largest of three numbers or Java Program to Find the Largest Among Three Numbers or Java Program to Find Largest Between Three Numbers Using Ternary operator or Java Program to Find the Biggest of 3 Numbers or Biggest of three numbers using Logical Operators in Java or How to find largest of three Integers in Java. 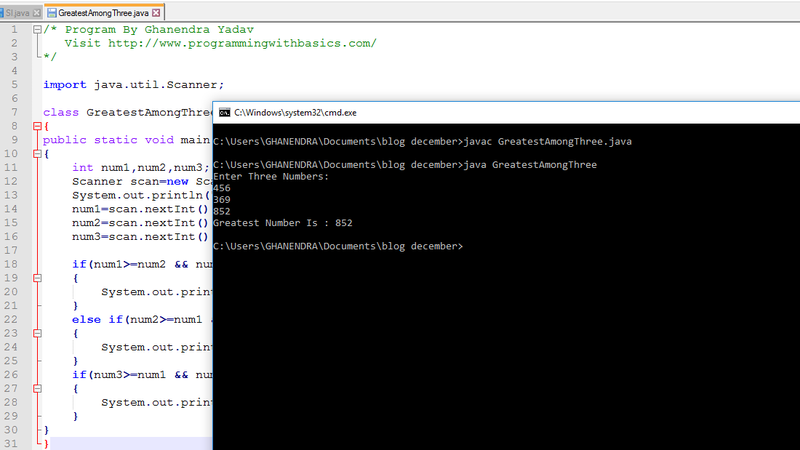 Write a C Program for finding the greatest number among given three number. Logic:- To solve this problem we need to compare all three numbers each other .for better explanation we need three number assume that numbers are 17, 45, 56. ex-you have to give three number, a number may be Integer, Float, Double your task is to find the Greatest number Input given by the user.